It’s a highly anticipated event. Every year, thousands of people pour into the California desert for the Coachella Music & Arts Festival with the promise of great music and a good time. The buzz is inescapable. When Coachella’s music lineup is announced, social media outlets are utterly flooded. Though in the past couple years, you may have noticed a new lineup has emerged alongside: Coachella’s Food Lineup. Among the countless photos documenting music performances, celebrity sightings, festival fashion, and priceless moments with friends, you can now find snapshots of what everyone is eating! And from the looks of the photos, food is no longer an afterthought. It is easy to see that seasoned festival-goers are ditching the power bars and sports drinks they used to pack in favor of more appetizing fare. While Coachella’s featured festival staples have long since been elevated from generic pizza and hot dogs to gourmet street food, recent years have brought an exciting turnout of star chefs and full-service restaurant pop-ups into the mix, redefining festival food. One look at Coachella’s extensive food and beverage selection (which now includes such items as açai bowls, Korean BBQ, sushi hand rolls, ramen, and paella) and it becomes clear that it is not just about quick bites festival-goers can grab in between sets anymore. That’s because as attendance to the annual festival continues to break records, Coachella is evolving into an all-encompassing experience — using food not only to appeal to those who may not typically go to music festivals, but also to invite attendees to the dinner table. The pioneering food program has been bold in this pursuit, even going so far as to make events out of the meals, themselves. Of this, there is no better example than the featured Outstanding in the Field dinners. Three years ago, when Nic Alder got the green light to take Coachella’s food program to the next level, his team approached Jim Denevan, the Founder & CEO of Outstanding in the Field, to bring his unique dining experience to the festival grounds. 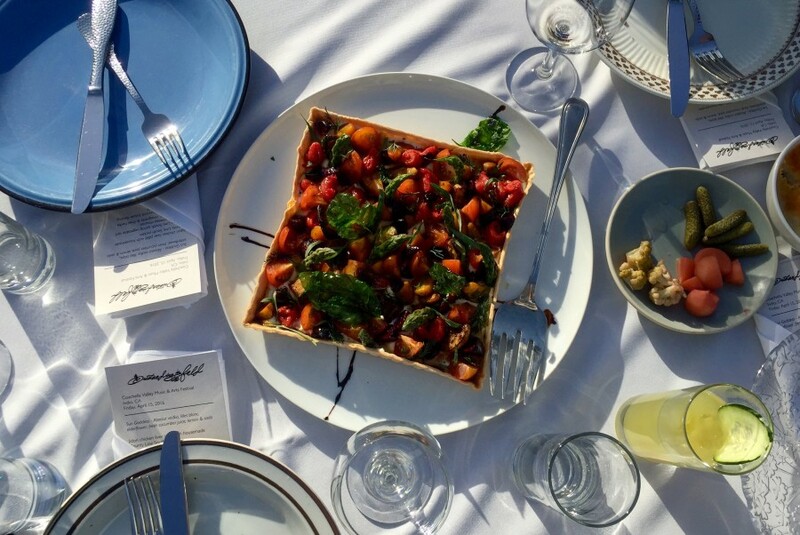 For $225 per person, Coachella attendees can treat themselves to a beautiful four-course dinner, cooked by notable chefs and set at an elegant, white-clothed, communal table. The meals, served family-style, come complete with welcome cocktails and carefully selected wine pairings. There are two dinner seatings available per day, and each day features a different set of chefs collaborating on the meal. While an upscale, sit-down dinner is not typically what comes to mind when you think “festival food,” the dinners (which, to Denevan, embody adventure, camaraderie, whimsy, and generosity) are a perfect fit. 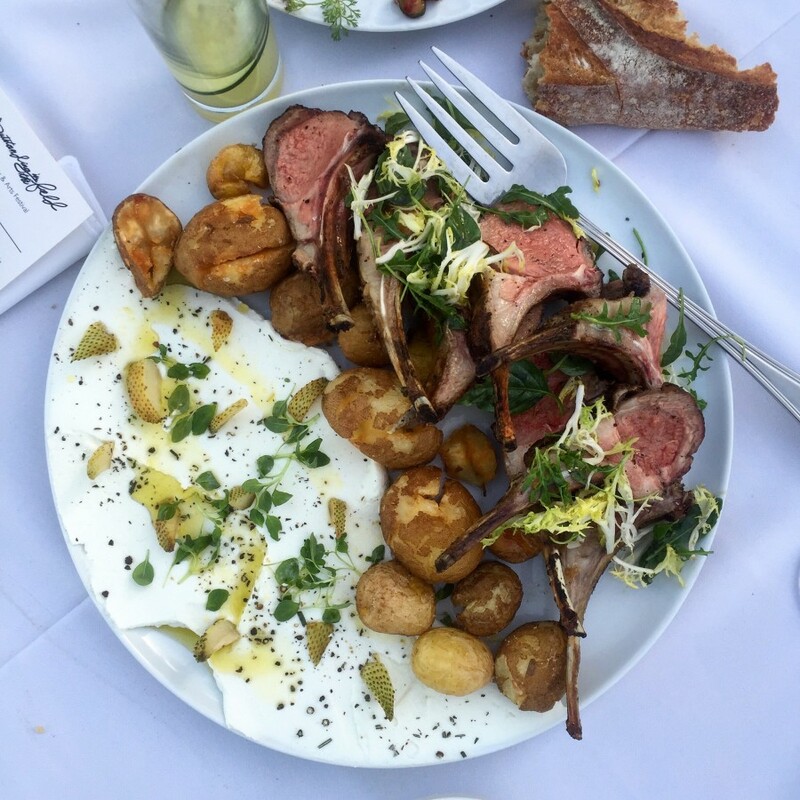 Located in the Rose Garden next to the Sahara Tent, the dinner, itself, felt like a party. At one such dinner, during Weekend 1, diners wasted no time getting to know each other, letting loose, and documenting all the action for Snapchat, Instagram, and even YouTube. For some, packages that bundled together festival passes with a dinner seating were a great way to score last minute tickets. Because of this, the table was filled with self-proclaimed foodies as well as people who hadn’t experienced anything like it. Many were pleased to try foods they had never had before, and the communal setting encouraged an adventurous open-mindedness. Conversations up and down the table reflected a unique attention to and engagement with the food being passed around. Toward the end of the dinner, Denevan and Retsky came by to say hello and meet everyone. “Where we live is not an abstract concept. There’s real people that grow food, and you can meet them and say hello, and they can tell their story. And the table is the magnet for the stories,” says Denevan. With its thoughtful curation of food offerings and dining experiences, Coachella’s progressive food program is using food to engage the public on various levels. Regardless of whether their wristband said V.I.P. or G.A., Coachella attendees were seeing festival fare in a new light. While not everyone will come specifically for the food, food has become something to consider as part of the overall experience. 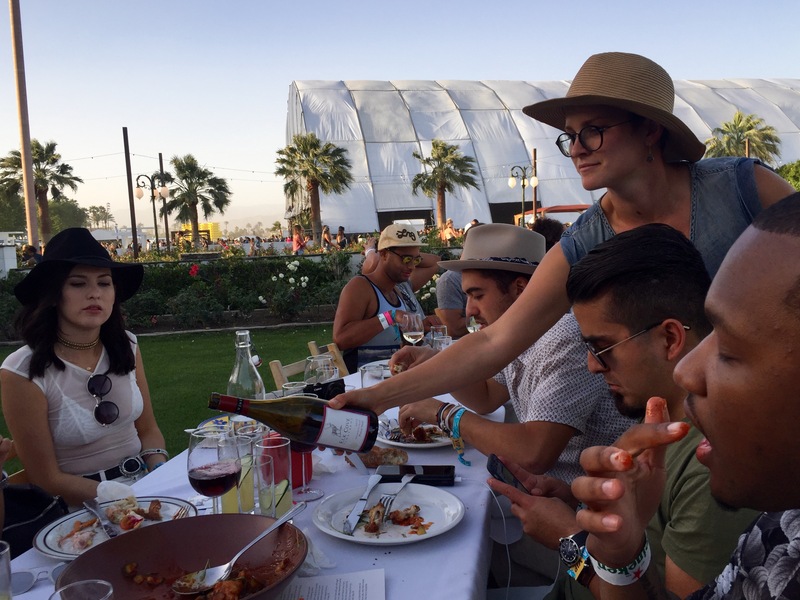 Whatever your approach to eating, Coachella is doing something novel: It is enriching the festival experience and inviting people to the table.